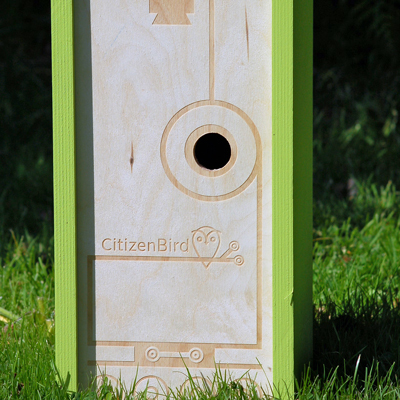 We have gone through a wide range of nest box designs over the last 3-4 years. We are really pleased with this latest version – in terms of cost, ease of construction and robustness. We’ve moved on from pine to stout, 18mm plywood, pinned and glued. This is stronger and much more stable which means the joints will resist moving and so remain weatherproof. This stability has also allowed us to go with a sliding front panel, which provides great access for setting up the CiBi500, as well as accessing the nest box camera and for cleaning out the nest at season’s end. The water-based, exterior grade paint in Citizen Bird green looks great in our opinion and should provide additional weatherproofing.